Aside from publishing content online, Visme allows you to download your work for offline use. 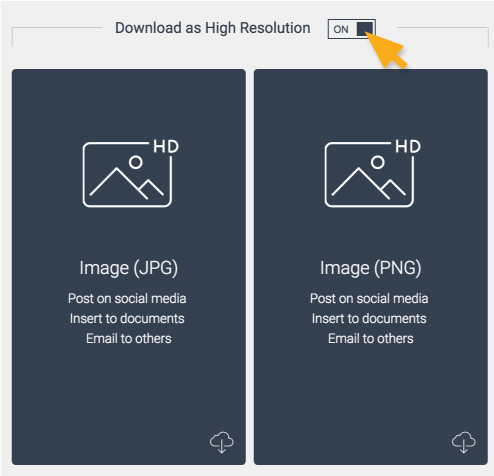 There are multiple ways to Download your project including the ability to download as an image (JPG/PNG), document (PDF), document (PPTX) and HTML5. Open your desired project in Visme so you can download it. Click Download on the top right side of your screen to launch the download window. Now you can decide what format you want your project to download as. JPG is available with free plans while PNG is available in Premium. This option allows you to download an image (like a screenshot) of your project. If you are looking to insert your project as an image to your website or use it on screen elsewhere, this would be the preferred option. Note: All slides will be downloaded as JPG/PNG once you’ve start to click Download as JPG/PNG. You can open the Downloads folder to see slides that you have downloaded. By clicking on the ON button in Download as High Resolution, it will gives you a higher resolution to your project. This is available if you have premium account. PDF is a great option because it will download the content as high quality digital documents. PDF’s are standard document formats that can be opened by virtually anyone and anywhere. You can also use PDF version for printing. Although it is not recommended for professional printing, the PDF version can be printed in-house as it will retain all vector (scalable) objects. If you have multiple slides, the Document (PDF) will download all of your slides into a multi-page document. Note: There is a limit to how many slides you can download at a time (typically limited to 50 slides). This is a great alternative for an offline use versus having your project on the Cloud. The HTML version (which is really HTML5- the latest iteration of HTML) preserves all the functionality you added in your project including animations. HTML download option is a great alternative if you want to maintain your projects interactivity (JPG. PNG, and PDF will lose the interactivity) without presenting it online. When you download your project in HTML file, you are actually downloading your project in a zip file (a standard compressed format). After you download HTML file, you need to make sure to extract the files from zip archive to your local folder by double clicking on the zip file. The project will then be in a folder. You can then open the file on any browser. Learn how to present offline to an audience.